For Your Consideration - The Hangover for Best Picture?! Wait, what?! Yep, this is real. 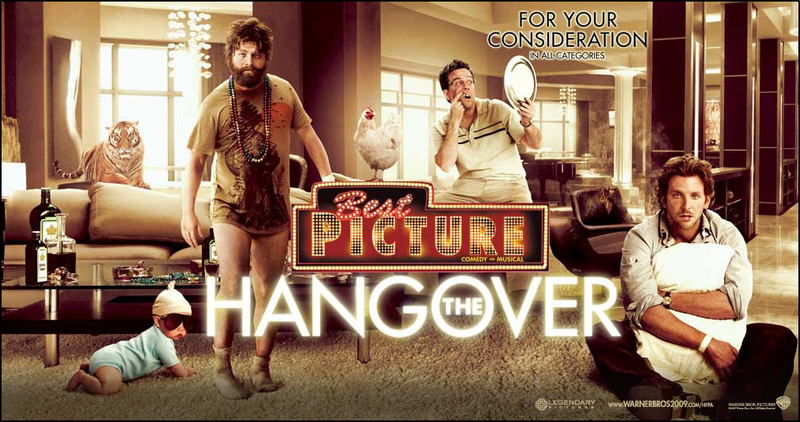 While browsing Variety tonight, this ad popped up on the website, asking for Academy voters to nominate the Warner Brothers' comedy The Hangover for Best Picture. We've seen plenty of For Your Consideration ads before (I featured the ad for Pixar's Up last week), but this is not an ad I ever expected to see. I liked The Hangover, but as the Best Picture? No way! What the heck is wrong with Warner Brothers? Is this a joke? It even says on the top: "For Your Consideration In All Categories." Does anyone actually think that Zach Galifianakis or Ed Helms should be nominated for Best Actor? Oh come on! At first I thought this was a big joke. Maybe someone at Warner Brothers wanted to have fun and put an ad in Variety saying that The Hangover should win Best Picture. I mean, that has to be a joke, right? Nope! If you look closely, underneath the "Best Picture" sign is a little bit of text that says "Comedy or Musical." Ahhhh right, this is for the Golden Globes, too! I definitely think The Hangover has a chance of winning (or at least getting nominated) for the Best Musical or Comedy category. Same with Zach Galifianakis or Ed Helms. So please don't flip out. It's not a joke, it is real, and it's for the Golden Globes. "So long gay boys!" actually, tony, it was funny. Yes, Tony, Real Talk is correct. It contained hilarious jokes and performances thereby making it funny. Sorry to disappoint you. Regards, Ethan. funniest movie I've seen the last few years. and it wasnt retarded funny either. i can't remember if there was an oscar for comedies, but if not, i can definitely see why they would try to get this nominated for best pic. every time it's drama, drama, drama. doesn't people want to see a few good action or comedy movies get noms too. this year being perfect with 10 noms available to have different kinds of movies like this and Up (or Wall-e) included in the category. @1) Either you're blind and def or you aren't human cause that was hilarious. #2, 3, 4, 5... I have to agree with #1. Their were some parts that was funny in the film but overall it wasnt the funniest film i have seen in years, hell Pineapple Express was funnier. But i guess the humor is meant for a certain type of people, just like the film Funny People. However, having to nominate this film for Best Picture is a joke. Not even close. I thought it was excellent, but it is clearly a joke. Read the fine print: "Comedy Or Musical". This is a FYC ad aimed at the HFPA for the Golden Globes, where "The Hangover", being the year's most successful comedy, stands a fine chance being nominated as Best Picture (Comedy/Musical). No, its freaking hilarious and all, but no. How about best Original Song? What do tigers dream of? When they take a little tiger snooze. wasnt saying it was actually oscar worthy, just sayin when was the last time you saw a comedy that was. or an animated(best pic nom) for that matter. this time theres a better chance for the latter to make an appearance. but say if Up won best pic, that would mean it has to win the best animated, and wouldnt that be a bit redundant? regardless, i digress. but i lost my train of thought anyways. i still believe there should be at least a comedy oscar, the academy needs to loosen up and take these movies for what they're worth, and recognize what they mean to the industry. Well, I went to the theaters to see it like I did with 20 other films this year. This movie was by far my best $9.50 investment of them all. So... yeah, it should win best picture in my opinion. Wow, this is really breaking news! As far as I know, a studio has NEVER promoted a film for Best Picture that didn't really have a chance! Good job on this, First Showing. Classy, classy site. @ #1 & 7: You've obviously never had a bad hangover where you can't remember what you did the night before. This movie was hilarious, it reminds me of college hahaha. I can watch it over and over and it never gets old. Hey, there have been strangest nominations for the Oscars, so I'm not surprised. Anything and everything nowadays gets an oscar campaign behind it. This doesn't mean anything. i do certainly think it was the best comedy of the year and in a year with some mundane movies, this could deserve a spot (afterall, there will be 10 spots)... it was a fun time at the movies, and it would nice to see a well produced and popular comedy be nominated for something at the Oscars which rarely happens. Comedy films are movies too and they should be recognized for achievement! not that this should ever win best picture nor is it as good as hundreds of other comedies that have failed over the years to get rewarded. Perhaps this will start a trend for the Academy to start recognizing comedies.... who knows? i wouldnt be surprised if it got a Best Comedy or Musical nom for Golden Globes as for acting...Zach was really really funny. he nailed the part and if he gets nominated i would be proud of those that voted for him. Its says Musical or Comedy, so Im pretty sure this is aimed at the Globes. That being said, if this was being pushed for Oscar BP i'd be against it. I enjoyed the film, I just wouldn't put it in my top ten, it isn't that I wouldnt want to see a Comedy as a BP contender, its that this film doesn't make that cut. i think it should win it waz a funny movie wit a great plot and a ending it waz funnier then pinapple express which in my opinion waz the funniest movie of 2008. if it doesnt win best picture then bradly cooper should be nominated 4 something cuz he waz very funny or atleast it should win best comedy. @ 1 & 7 Totally agree was NOT funny. It was as funny as the two idiot robots on Transformers 2. Sorry, I didn't find this to be one of the funniest films in years. Wasn't even one of the funniest THIS year (IMO). It was pleasant enough and amusing. But I laughed more in five minutes watching "Zombieland" than I did during "The Hangover". "In the Loop", "The Brothers Bloom" and "Observe and Report" were all also infinitely funnier. Again, just my two cents. Sorry! This was a crappy movie. Galifianakis certainly deserves consideration if his role qualifies as "supporting". How do you define what qualifies a picture to be a "Best Picture" nomination? We might start seeing some more comedies get nods now that 10 movies get nominated. Hangover is definitely still on my 2009 Top Ten list.